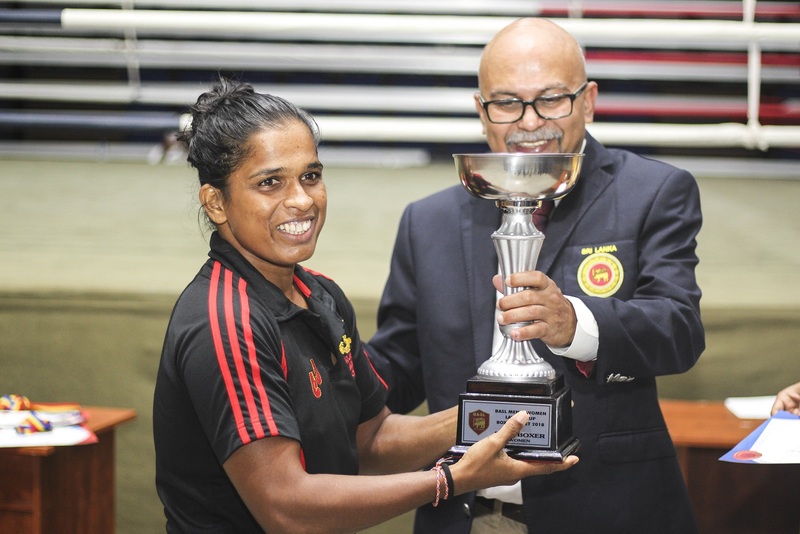 The Sri Lankan Boxing hosted their 77th edition of the Layton Cup in Colombo which was their first big national elite event for the women and men boxers in 2018. Among Sri Lanka’s best boxers Athwuda Achchilage Kosala Nilmini, Ruwan Thilina Weerakoddi and Pathirage Don Dinesh Maduranga won their weight classes before Addurakaram Rallage Eranda Thilakarathne surprised the crowd in the last bout of the Layton Cup. Sri Lanka achieved great results in the Commonwealth Games in Gold Coast where their boxers earned three bronze medals and made history for their boxing life. Sri Lanka sent six boxers including three women and three men to the boxing tournament of the Asian Games therefore these top athletes had to miss the Layton Cup. The Sri Lankan female boxers have been preparing to the AIBA Women’s World Boxing Championships and together with their best male hopes also to the 2019 South Asian Games which will be taking place in Kathmandu, Nepal next March. The Layton Cup is one of their traditional national events which were launched almost 80 years ago. Nineteen weight classes were held in the traditional Layton Cup this time. Athwuda Achchilage Kosala Nilmini attended in the last edition of the ASBC Asian Confederation Women’s Boxing Championships moved up one category and competed at the flyweight (51kg) in the Layton Cup. The experienced boxer controlled both of her contests in the event and won the title of this Olympic category. Muthuthanthri Sajeewani Cooray claimed the gold medal in the last edition of the Layton Cup, Clifford Cup and Sri Lankan Women’s National Championships therefore her next success was not a surprise. The 28-year-old bantamweight (54kg) boxer eliminated her main rival H.N.S. Thalgaspitiya in the semi-final and won the gold medal contest against W.S.P. Rathnayaka deciding the bout still in the first round. A younger hope L.G. Chandrika claimed silver medal at the bantamweight (54kg) in the last edition of the Layton Cup which she changed into gold at the featherweight (57kg) in the new edition. Pitigala K. Sumudu is a veteran woman boxer in Sri Lanka who joined to the national team in the last decade but she is still active and won her next title at the Layton Cup this time at the light welterweight (64kg). R.M.P. Dharmasena claimed several silver medals during his career in the national events but in the absence of Commonwealth Games bronze medallist Seneviratne Bandara he bagged gold at the men’s flyweight (52kg). Ruwan Thilina Weerakoddi attended already in the Baku 2011 AIBA World Boxing Championships, he claimed silver medal in the 2016 South Asian Games and returned in the national level with a gold medal. Bamunu Jeewantha Wimukthi Kumara celebrated his 27th birthday a few days ago and after six years of experiences in the national level events he won the Layton Cup at the lightweight (60kg). This category was the most popular in the whole event with the participation of 15 boxers but Kumara was able to dominate all of his fights. Dinidu Dushan Saparamadu is the best Sri Lankan man boxer but in his absence R.W.M.S.B. Rajakaruna, who was titleholder at the men’s light welterweight (64kg), controlled his contests in the Layton Cup. The 31-year-old Pathirage Don Dinesh Maduranga attended in the Glasgow 2014 Commonwealth Games and also in the Military World Boxing Championships and those experiences paid off in the Layton Cup. ASBC Asian Confederation Boxing Championships competitor Addurakaram Rallage Eranda Thilakarathne lost to Doha International Tournament silver medallist Lahiru Tharanga Rathnadiwakara several times during his career but he did revenge in the new Layton Cup. The 26-year-old Thilakarathne was slightly better against his taller rival and won their difficult bout by 3:2 in Colombo.